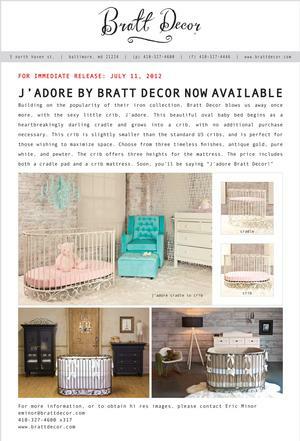 The gorgeous little iron oval crib, is now available from Bratt Decor. In this fresh and lovely piece by American Baby, our very own casablanca premiere in antique white is decked out in fun floral just in time for summer. 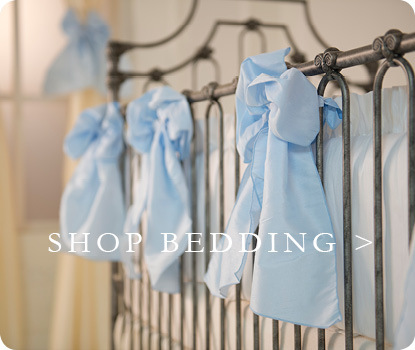 When writer Amy Ledbetter went on the hunt for the absolute most stunning products to fill the ultimate baby room, she found Bratt Decor, and fell in love with the elegance of our Chelsea Silver collection. A spring tradition in Washington is the D.C. Design House makeover of a prominent home in the District. This year, a house that has been in the same family since the 1950s was made-over by 23 local designers and landscapers. A seven-bedroom Spring Valley house at 4951 Rockwood Parkway N.W. is this year's DC Design House. It's a fundrasier for the Children's National Medical Center. The nursery is a stunning contemporary vision designed by Elizabeth Krial and featuring Bratt Decor's grand soho crib with loft. The Architectural Digest Home Show in NY boasted vibrant colors, fresh traditionalism, and natural mediums. Read about what's trending for tomorrow in design. 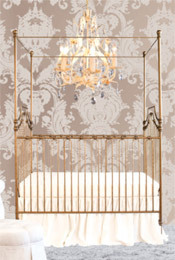 Bratt Decor's beautiful and versatile Chelsea Lifetime in iron was featured in this article entitled, "Sleep Well Baby". The article highlights such great features as convertibility to a full size bed, multiple heights for the mattress, and three stunning finishes: antique silver, espresso and white. 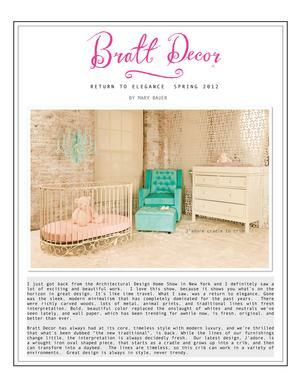 FOR IMMEDIATE RELEASE: MARCH 7, 2012 JESSICA SIMPSON CHOOSE BRATT DÉCOR FOR HER NURSERY The Southern style maker is in full nesting mode putting together her baby girl’s nursery. The energy of the space is going to be relaxed and comfortable, channeling fresh visions of shabby chic. 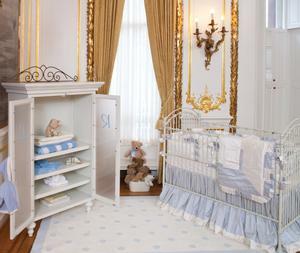 For her crib choice, Ms. Simpson choose Bratt Décor’s beautifully simple and ever elegant Park Avenue crib in white. 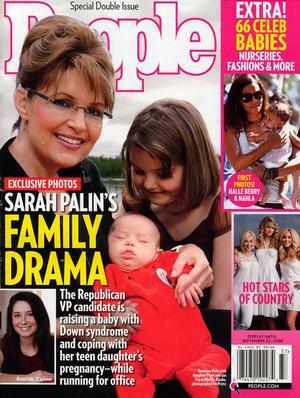 Her baby is due this Spring. Bratt Decor's beautiful chelsea lifetime in iron shines in this fantastic article honoring the richness and luster of metallics. "Whether you prefer the glitz of radiant gold or the history of burnished bronze, metallics give a rich luster to a room that few materials can emulate. What began as an accessory trend, with antique silver frames and gilded mirrors, can now be seen in wall coverings, fabrics and large-scale furniture and in colors that go beyond nature’s creations with luminescent purples, blues and greens." The cutesy sleep space-a surprise from Parks's mom after the Real Housewives of Atlanta star welcomed now 7 month old son, Dylan prominently features the Red Doggy Days pattern from Carousel Designs on Bratt Decor's classic casablanca iron crib in pewter. 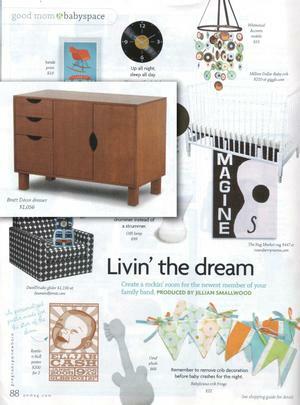 Bratt Decor's blu dresser in wheat is highlighted in the amazing collection of hot baby products, entitled "Livin' the dream". 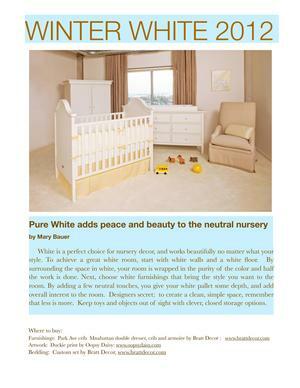 Pure white adds peace and beauty to the neutral nursery. A modern zone for the latest big thing (who just so happens to be pretty tiny). 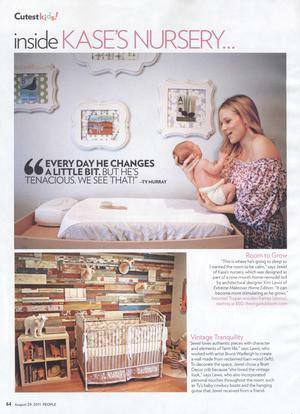 Bratt Decor's Manhattan Bookcase was selected to headline the Modern Good Mom & Baby Space feature in May's Pregnancy & Newborn. 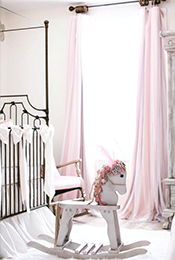 Gone are the days of only two room-decorating choices for your little one: blue or pink for boy or girl and, if you wanted to get crazy, the occasional gender-neutral pale green or yellow. 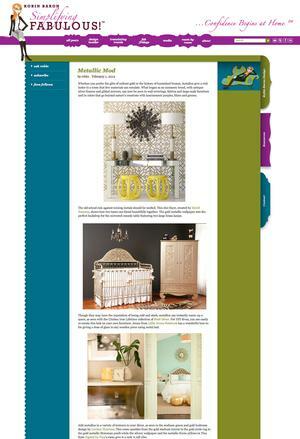 Emerging trends in nursery and children’s room décor have opened up a multitude of possibilities to parents and kids. 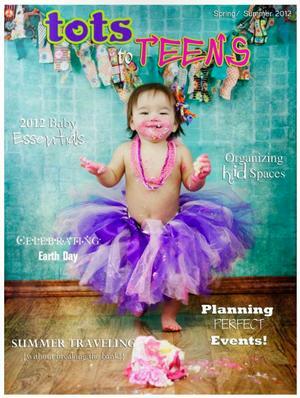 Decorating themes, murals, 3-D effects, textures and patterns can give your child a vibrant sanctuary, while meeting the needs of every mommy to be. Studios like Little Crown Interiors are quickly becoming the norm for parents who want efficiency, safety and the latest décor. 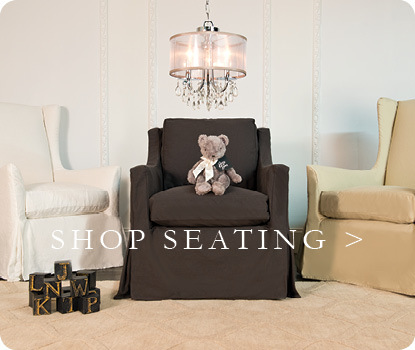 Owners and co-founders of Little Crown Interiors, Gerri Panebianco and Naomi Coe, have established themselves as visionaries of one-of-a-kind spaces for children. I am a woman of many passions, and chief among them is my love of family. 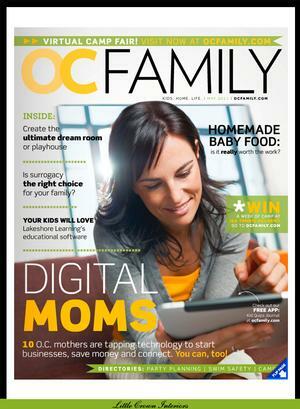 When my husband, Stephen, and I were expecting our first child, we were both over joyed, overwhelmed. Both Stephen and I love design, and were not satisfied with what was available in the marketplace for furnishings. 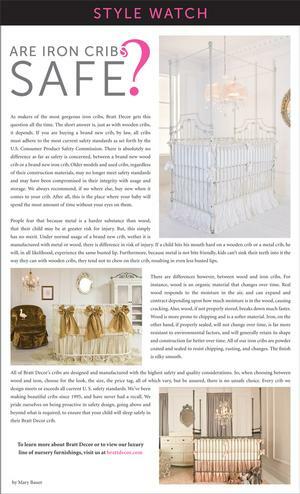 So, we designed a beautiful wrought iron baby crib, and that was the beginning of our business, Bratt Decor, and our family. This company is so tied to my heart. It draws on my love of art and design, and the miraculous time in one’s life when they become a parent. I don’t believe there’s any other single event that changes a person like loving and caring for your own child. I get to work with my husband every day, and together we put reflections of our definition of beauty into the world. It’s a really good job. Outfit your family with goods that go the distance. 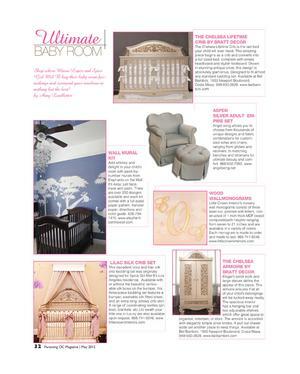 Bratt Decor's Manhattan Dresser was selected by Pregnancy & Newborn magazine as a must-have to give your nursery furniture longer life. "Once baby is past her diaper days, remove the changing tray and continue using this timeless chest of drawers for years to come." Stars have access to the absolute best of everything, and it’s no exception when it comes to their little ones. 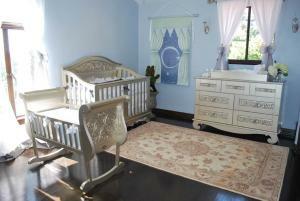 And from gilded cribs to silver velvet feeding chairs, nursery designer-to-the-stars Mary Bauer has seen it all. 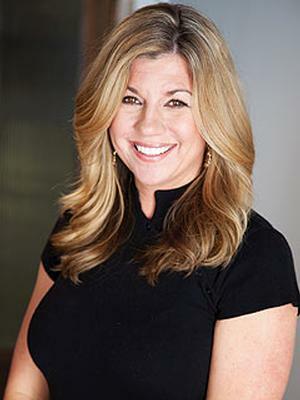 Now, the president and CEO of Bratt Decor — she’s worked with everyone from Jennifer Lopez and Kourtney Kardashian to Ali Landry and Jewel — is ready to share some of her easy-to-follow tips and tricks to help you create a spectacular nursery for your little super star. 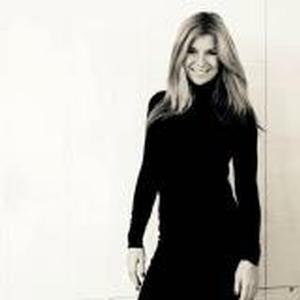 Check out her design secrets below. Choose a great crib. Whatever your budget, don’t scrimp on the crib. Not only does it set the tone for the entire room, but it’s the place where your baby spends the most time without you so it should be a safe and comfortable space. Nate shows a viewer how to re-creat a nursery for twins similar to the beautiful room Jennifer Lopez created for her twins. 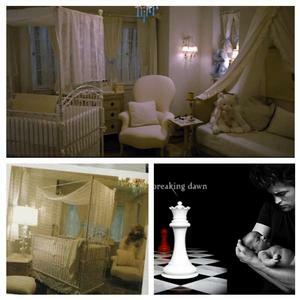 Nate used Bratt Decor's casablanca premiere cribs, just as Jennifer did, and dressed them with Little Bunny Blue linens. 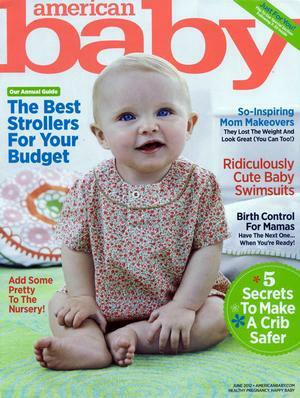 To see the episode go to thenateshow.com and search "celeb baby rooms"
Courtney Mazza, red hot girlfriend of Mario Lopez, is featured on the cover and in this in depth article that covers everything from cravings to the nursery. 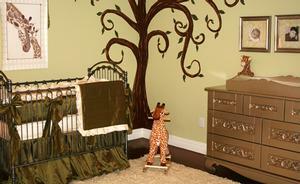 "Bratt Decor helped design the nursery and they went above and beyond what I expected. It's my favorite room in the house. I go in there now and take my laptop and sit on the rocking chair. I'll take Julio in and w'ell just hang out, it's so peaceful." 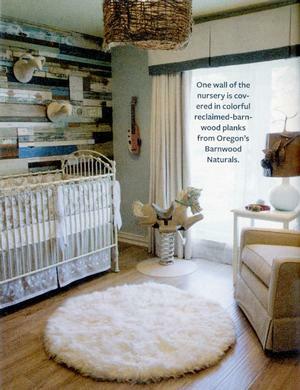 Says Mazza of her Bratt Decor designer nursery. Check Courtney and Mario out in their newest show, "Saved by the Baby" on VH1.